Sometimes, it’s the simplest of foods that are the most delicious. That’s most def the case with cacio e pepe, a classic Italian pasta dish that translates, literally to “cheese and pepper.” Traditionally the sauce is made with pecorino romano, pepper, reserved pasta water, and butter. Cheese and pasta is super yum, but you can completely veganize it and have it taste just as delish—and it’s way healthier. The plant-based version is creamy, comforting, and so crazy delicious it’s nuts—literally! The trick is not overcomplicating things, which is in keeping with what amazing cacio e pepe is. To create that super creamy texture, I use a thinned out cashew cream. A dusting of homemade vegan parmesan made with heart-healthy sunflower seeds, onion powder, nutritional yeast (which is loaded with B vitamins), and just a little garlic, provides that cheesy flavor. Cauliflower—high in fiber, low in calories, and gluten-free—subs for pasta in this recipe. I love the tender, meaty texture the cruciferous veg takes on when it’s cooked in a pan with a little olive oil and vegan butter, but you could just as easily toss the sauce with sautéed zucchini noodles, B-sprouts, or kale if you prefer. Even if you aren’t following a plant-based diet, this recipe is so good, you might consider trying it the next time you get the hankering for something warm, cheesy and creamy. Want to dig into a plate of vegan cacio e pepe cauliflower tonight? Keep reading to get the recipe. The real magic here is in the cashew cream. I’ve made cashew cream a bunch of times and I have to say, this is one place where time is crucial. The cashews really do need to soak for a loooong time for them to cream up nicely. I suggest letting them soak in water in a mason jar or any other covered glass container the fridge overnight or longer. You can double the recipe and store it in the fridge to use in other recipes for four days. 1. Place cashews in a glass container and cover with water. Let sit, covered, 8 to 12 hours. Drain in a fine mesh sieve, rinse well and transfer to a high powered blender. Add a half cup water and blend until creamy. Transfer to a glass container and set aside. 2. In a clean, high powered blender add sunflower seeds, nutritional yeast, onion powder, and garlic and blend until powdery. Transfer to another container and set aside. 3. In a large pan over medium heat, add olive oil, vegan butter and cauliflower and cook until cauliflower is tender, seven to eight minutes. If the pan gets too dry, add one-fourth cup of water. Add garlic and cook one minute more. Season with salt and fresh black pepper to taste. 4. Pour one half to three fourths of the cashew cream on the cauliflower and toss. Transfer to a serving plate and sprinkle generously with vegan parmesan. Top with finely chopped arugula or parsley if desired. 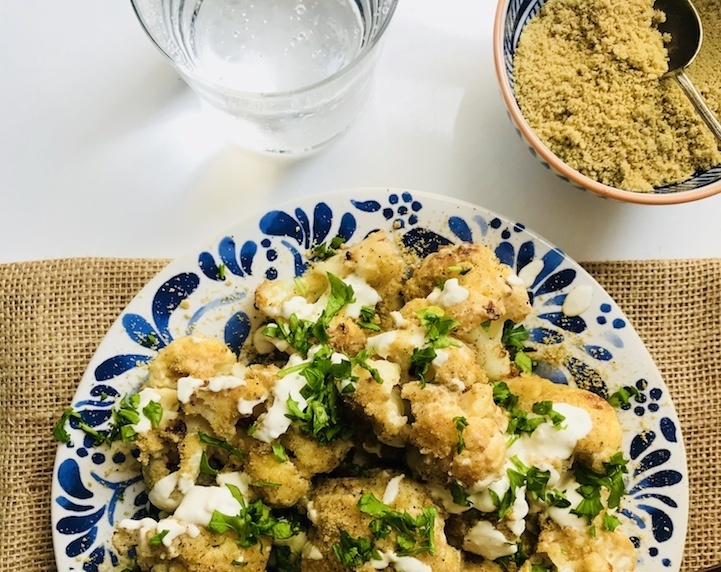 If you have leftover cauliflower in the fridge, check out this how-to for making your own cauliflower rice or these five genius recipes for using the versatile veg in everything from tangy smoothies to hearty soups.